1 Boil potatoes in salted water until tender, 20-30 minutes. Drain and keep warm. 2 For the salad: Rinse and trim leeks. Cut leeks into thin rings. Peel and slice carrots. Peel and thinly slice onion. 3 Heat 2 tablespoons butter in a pan and sauté sliced onion. Add carrots and cook, stirring occasionally. When onions and carrots are soft, add leeks and 50 ml (approximately 1 2/3 cups) water. Cover and simmer for 5-8 minutes over low heat. Season with salt, pepper and ginger powder. 4 For the herbed quark: Combine quark, creme fraiche, olive oil, chives and salt and pepper to taste. 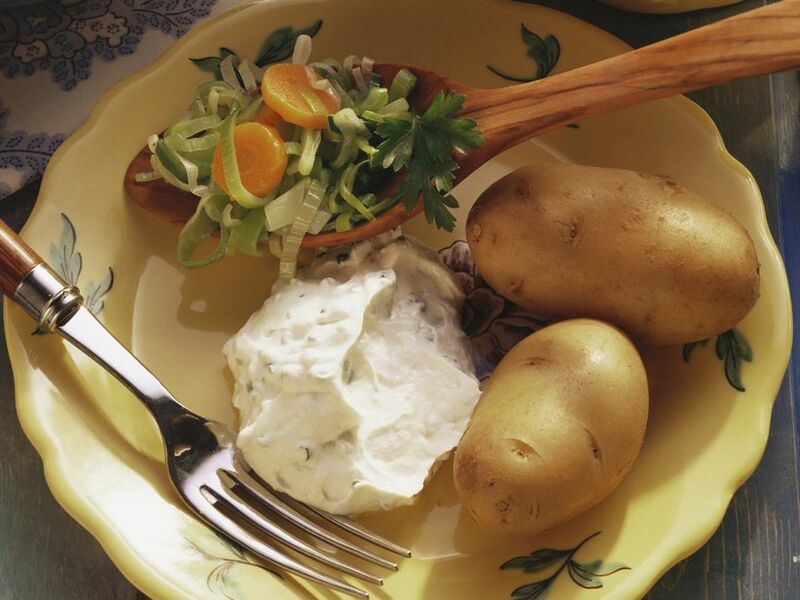 Arrange carrots and leeks with potatoes and quark on plates. Serve immediately.